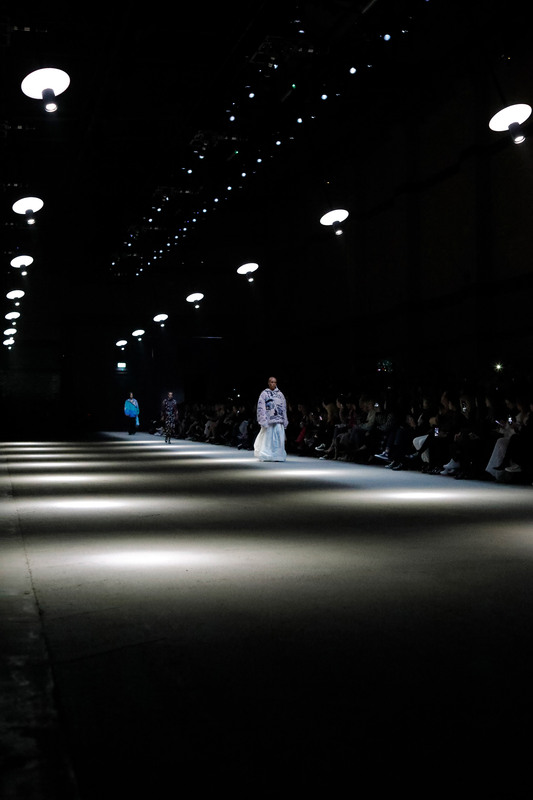 The brand's autumn winter 2018 presentation – the last to be overseen by creative director Christopher Bailey – took place on Sunday, 18 February as part of this year's London Fashion Week. 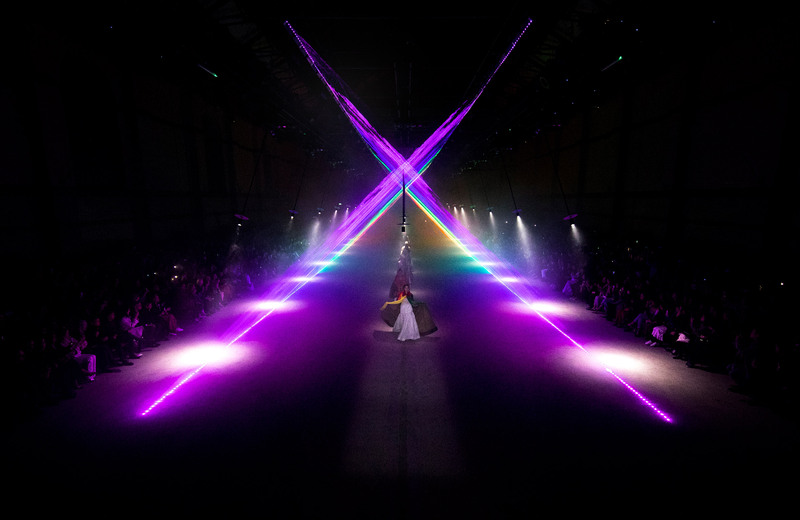 In collaboration with United Visual Artists (UVA), Burberry put on the show at London's Dimco Building that included two dramatic light installations. The first of these was a reincarnation of a previous UVA installation created in 2016 named Our Time, which Burberry loaned from the Museum of Old Art and New Art in Hobart, Australia. The design saw multiple swinging pendulum lights casting circular beams onto the floor. Each of the 21 pendulums was programmed to trace light paths across space, as well as responding to sounds, echoes and music. "Our Time is a multisensory immersive installation piece, comprising a number of kinetic swinging pendulums that oscillate and move unpredictably, seemingly unhindered by the laws of nature & gravity," said UVA. "Characteristic of UVA's output, meticulous planning and engineering simulates the idea of a natural order at work beyond our own bodily limits, creating a brief respite from reality." 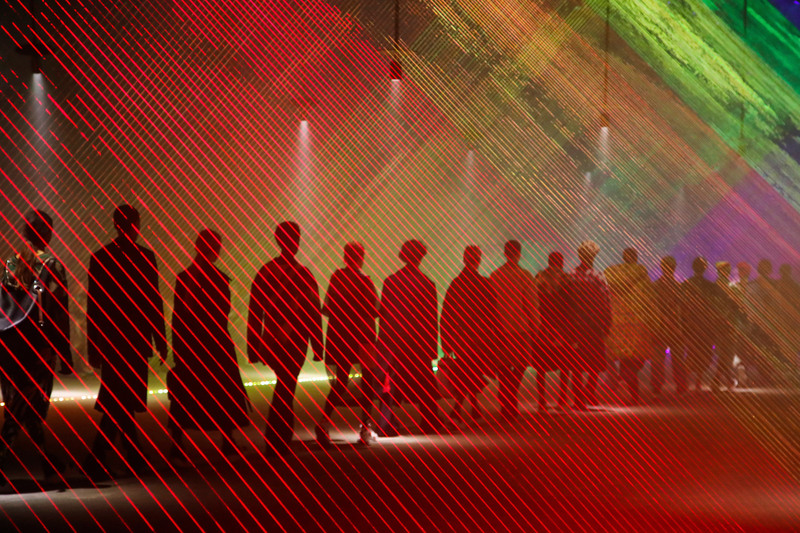 For the finale, Bailey tasked UVA with creating an installation that would represent his 17-year career at Burberry. He also wanted it to reflect the rainbow tartan designed for the latest collection, which he introduced in support of LGBT charities. 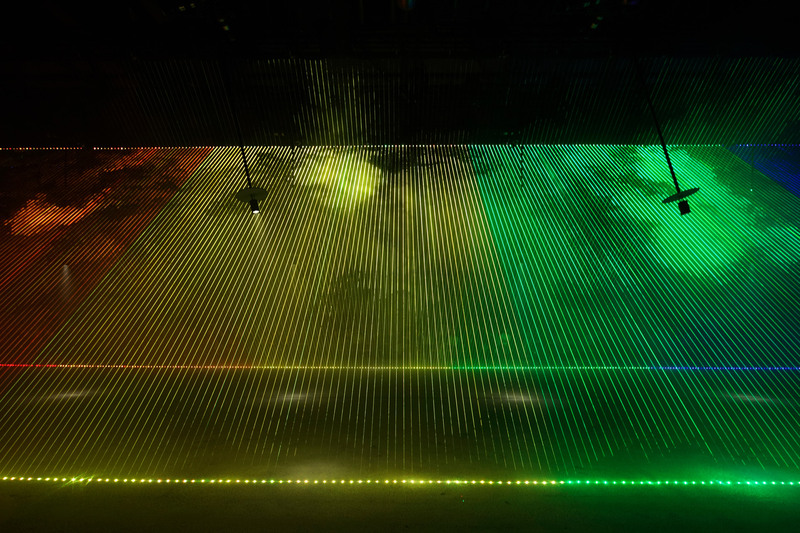 UVA responded with a design that used 3000 rainbow-hued lasers to create an "architectural intervention of pure light". "The spirit and ideas behind Our Time found a perfect counterpart in Christopher Bailey and his final collection as creative director of Burberry," said UVA. "After 17 years at the esteemed British couture brand, Bailey drew on past and present for his February 2018 runway show, entitled Time." 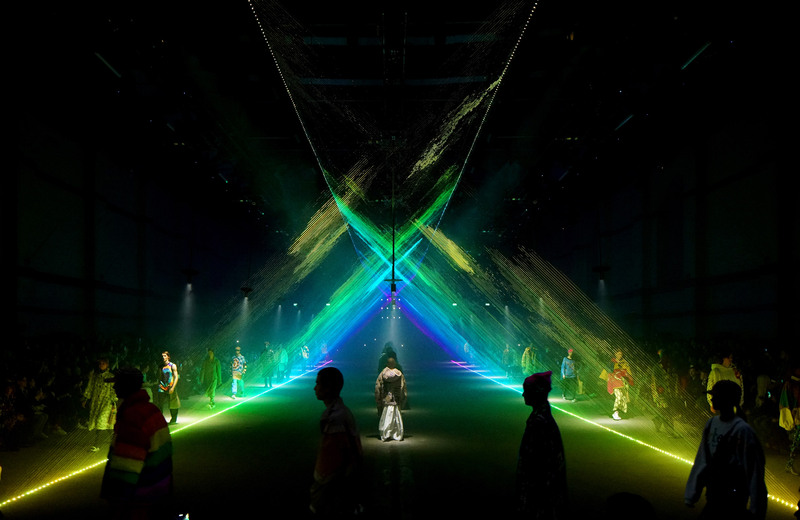 "Just as UVA's Our Time modifies the natural rhythms and orders of the pendulum in space, this final collection collapsed past, present and future – encompassing prominent reissues from their archive through to Bailey’s final interpretation of the Burberry check: finished with rainbow print, a homage to LGBTQ+ communities worldwide." 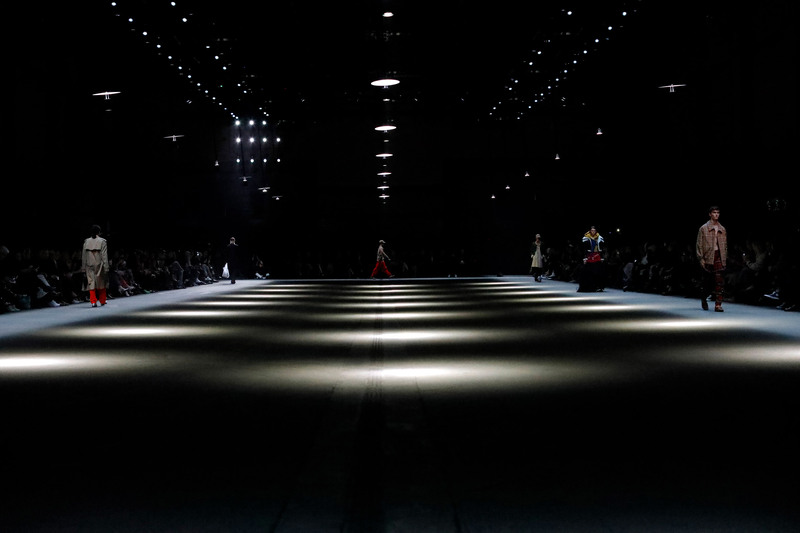 The show marks Bailey's departure from Burberry, who joined the British brand in 2001. Since being appointed chief creative officer in 2009, he has guided the brand through a number of significant business decisions, such as the choice to make collections available to purchase straight after they are shown on the runway, as opposed to the typical four-month delay. Burberry is now looking to find a successor, although Bailey will continue to provide support to CEO Marco Gobetti until December 2018.